Rehydrate the TVP by boiling the veggie stock and then pouring it over the TVP. Let stand 10 minutes. 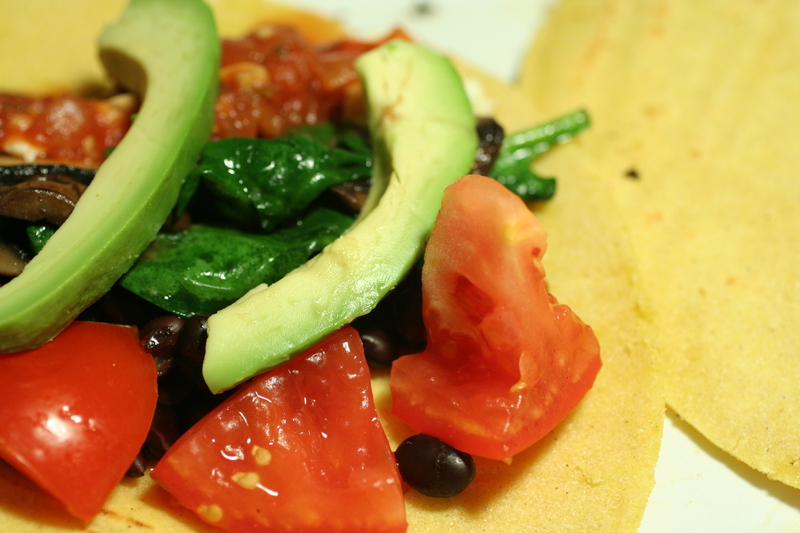 mix in 1 egg and drained beans. Mash with a fork (I eventually resorted to using my hands) until smooth. 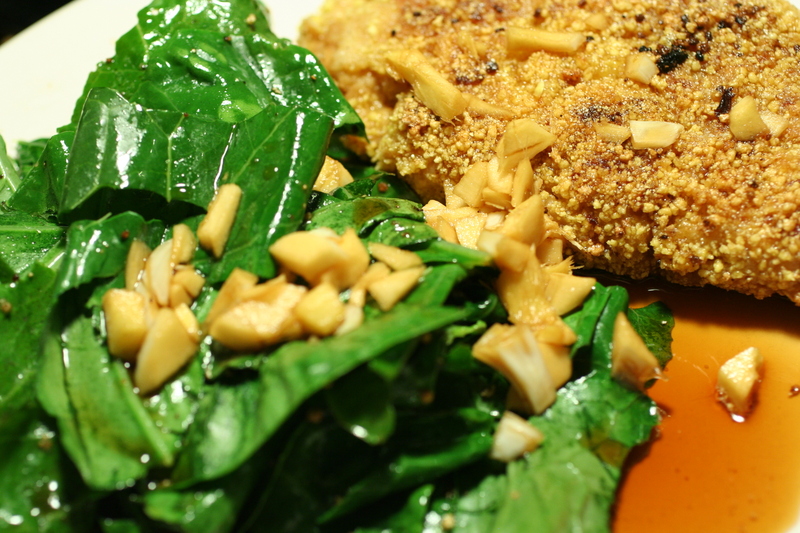 form into cutlet shape and chill on a plate in the fridge for 15-20 minutes. Try to make them hand-sized or smaller, or else they will fall apart. Once they’re chilled, wisk the 2nd egg, dip the cutlets into the egg mixture and then the brown rice flour, and last coat in bread crumbs. Pour enough olive oil into a sauté pan to cover the bottom of the pan, then drop a cutlet in and cook for about 5 minutes on each side over medium heat, until browned. Cutlets! For the sauce, chop the garlic and ginger and heat in a saucepan with the agave, vinegar, and tamari. I just put in as much as I wanted to cover the cutlets and the collards, maybe 1/2 c total. You don’t need to boil it, just heat until the agave is dissolved. For the collards, cut the spines out and chop up the leaves. Sauté them in olive oil over medium-low heat for a couple minutes. 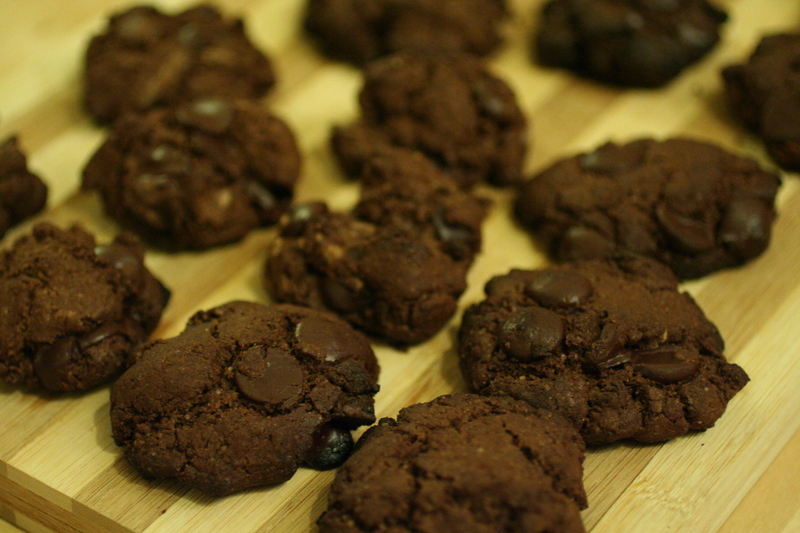 Carol Fenster’s Double Chocolate Cookie Recipe, with Ghirardelli chips and cocoa, sorghum/tapioca/rice flour mix, and all the usual suspects. So tasty! 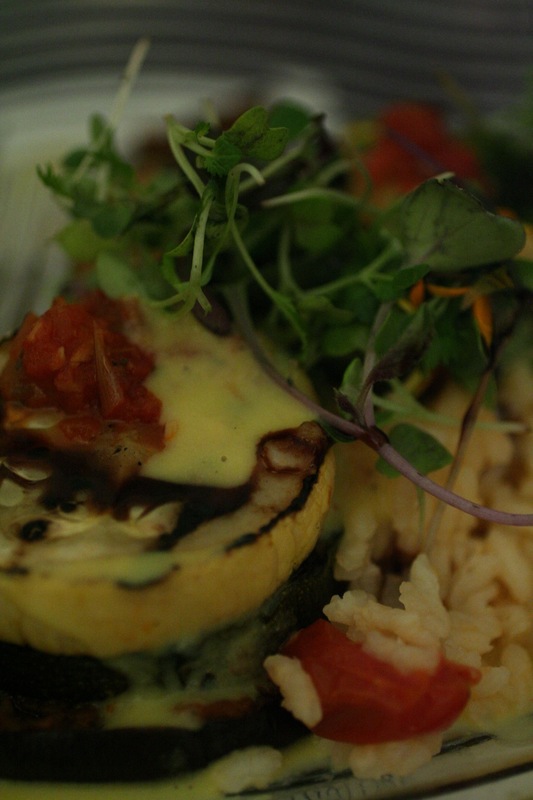 Delicious food catered by Cameron Mitchell at my boyfriend’s sister’s wedding in Columbus, Ohio. First photo is from the rehearsal dinner, from the “Italian station.” Not pictured are the “Asian station” and the “Mexican station” where I had Tofu Pad Thai with rice noodles and black bean fajitas with corn tortillas made especially for me. Second photo is from the reception, which was also quite delicious. The company was very friendly and spoke to me beforehand to assure me that they had catered entire gluten-free weddings in the past, and to let me know what they would be serving that was gluten-free in advance. 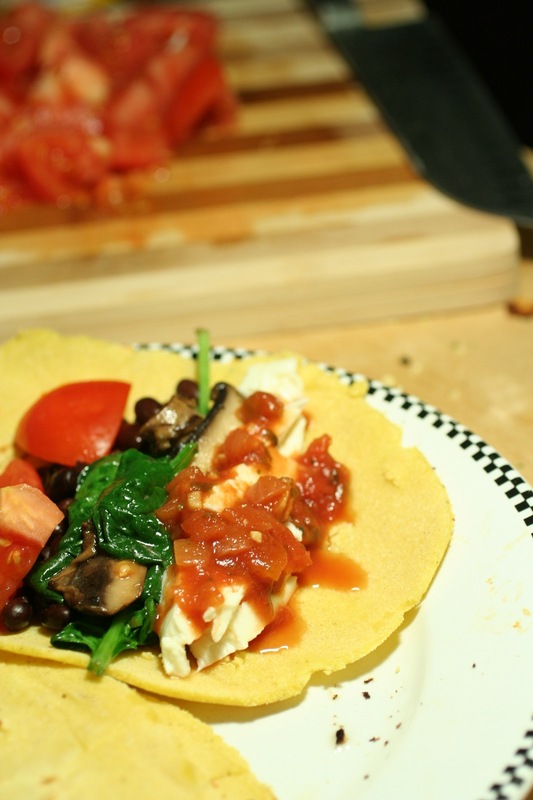 In the tacos: black beans, sauteed spinach and mushrooms, queso blanco, avocado, tomato and salsa. Also, I tried to make cookies with quinoa, almond flour, applesauce and agave, among other things. Absolute failure! I think my oven is cursed. It sees what I put in the oven, figures out that it’s supposed to turn into cookies, and says “no way!” Everything else turns out fine. But no cookies. Maybe next time I will just try to make something basic like chocolate chip cookies with sugar and eggs, and just replace the wheat flour with the Carol Fenster sorghum mix and hope my oven is placated. Maybe it just wants less variables to deal with. 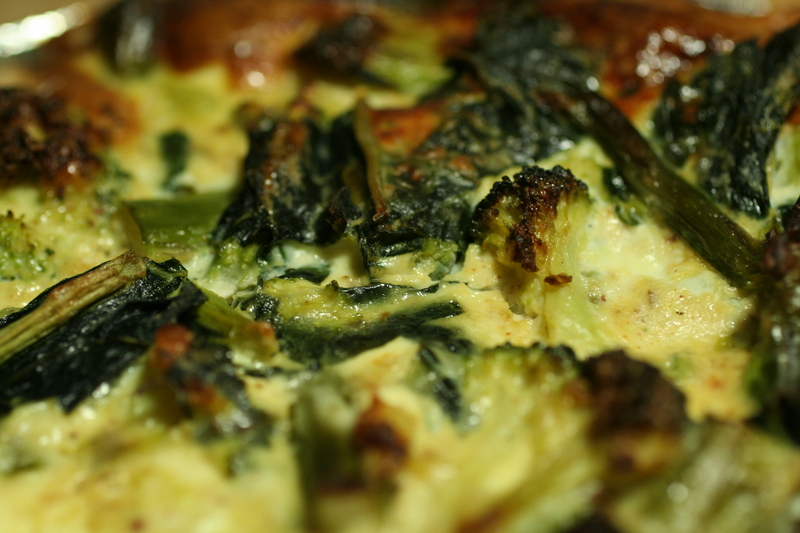 Case in point: delectable quiche, made on the same day in the same oven. Crust was a Carol Fenster recipe, using her sorghum mix with some extra tapioca and arrowroot starch to substitute for the sweet rice flour, which I couldn’t find anywhere. Learned from the Bittman cookbook how to boil vegetables for a short time and then “shock” them in an ice water bath, which leaves them looking great and retains the flavor better. 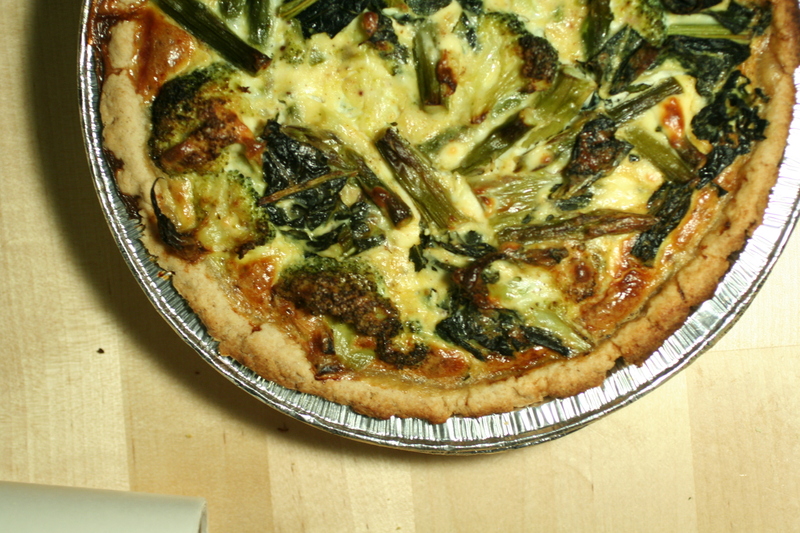 I filled the quiche with eggs, hempmilk, goat cheese, and precooked (the Bittman method) broccoli, kale and asparagus. The crust was perfect. Not flaky like gluten pastry crusts, but really tasty and crunchy enough around the edges to convince me. 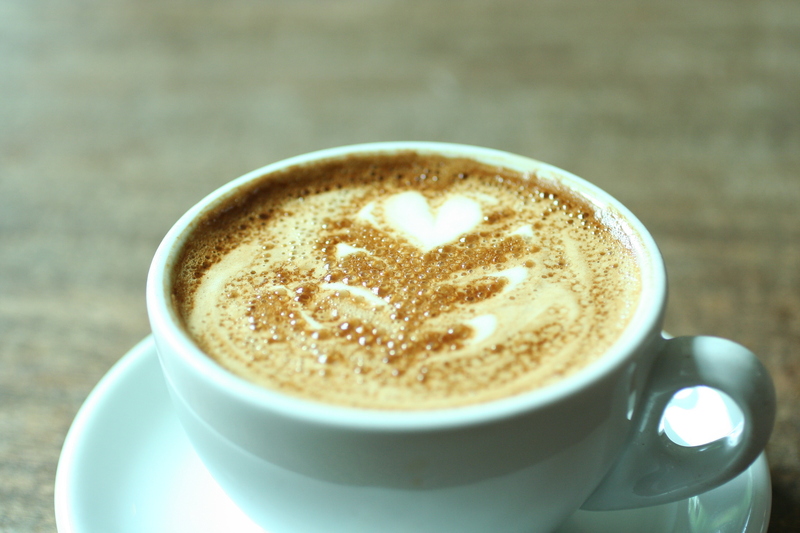 I was going to post about tonight’s experiment, soft tacos with homemade corn tortillas, but the result was a little less than attractive, so instead I’ll give you a picture of the best coffee ever. More food pictures later this week, I hope! This week I am in Seattle for an acoustics conference, my first trip with celiac. I was understandably nervous about traveling and all the potential hassles – getting in too late to grab groceries, not having a minifridge in the room (luckily, neither of these things were a problem – the minibar had enough space for my coconut milk and hummus, not having transportation or time to go out of the way to find gf meals. Mostly, I was worried that no one would want to go to the limited amount of places I had to choose from. Boy, was I wrong. I thought New York had a lot of options. Seattle is like a vegiac dream! Here’s the story so far. Before I went to the airport, I stocked up at whole foods, with cereal, coconut milk (JetBlue lets you check a bag for free, so liquids weren’t an issue), hummus, rice crackers, trail mix, and Larabars. Then, on the plane, they also had a gluten-free snack, so I was set for the flight and the next morning. Monday lunchtime, we wandered through Pike’s Place market, which is a few blocks from the hotel. I picked up an apple and some cheese, and then headed for Cinnamon Works, a bakery in the market with gluten-free baked goods. I had a walnut-apple-raisin muffin made with rice and tapioca flour that was very tasty. The market allowed everyone in the group to get what they wanted, so I didn’t hold anyone back with my dietary restrictions. Then, for dinner, I convinced a handful of people to venture “all the way” across town (took a taxi there and the driver was shocked we were traveling so far, but then the walk back ended up being only 25 minutes) to Cafe Flora, a DELICIOUS vegetarian restaurant with several vegan and gluten-free items on the menu. 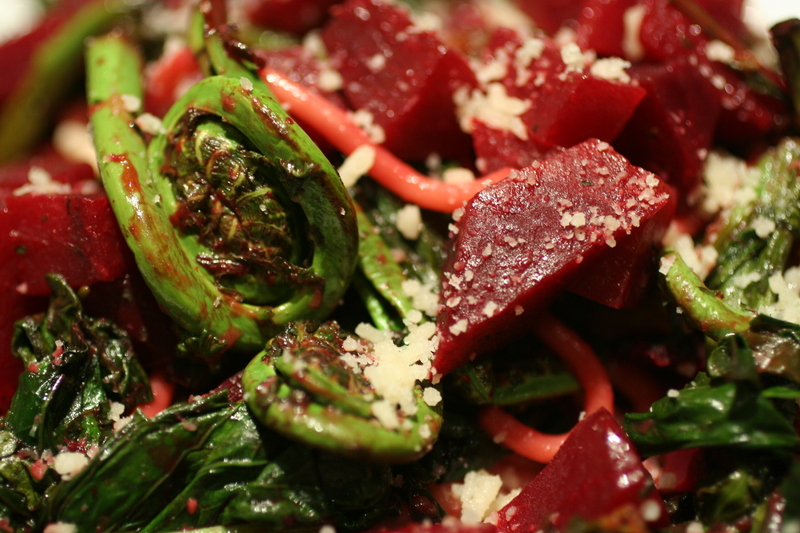 Many of the dishes were also seasonal. The ambiance was incredible, and we were seated in a glass-walled dining room with plants everywhere. To start, I had the lentil-pecan pate with pickled veggies and some sort of gf crackers. I was so hungry I forgot to take a photo before I dove in. 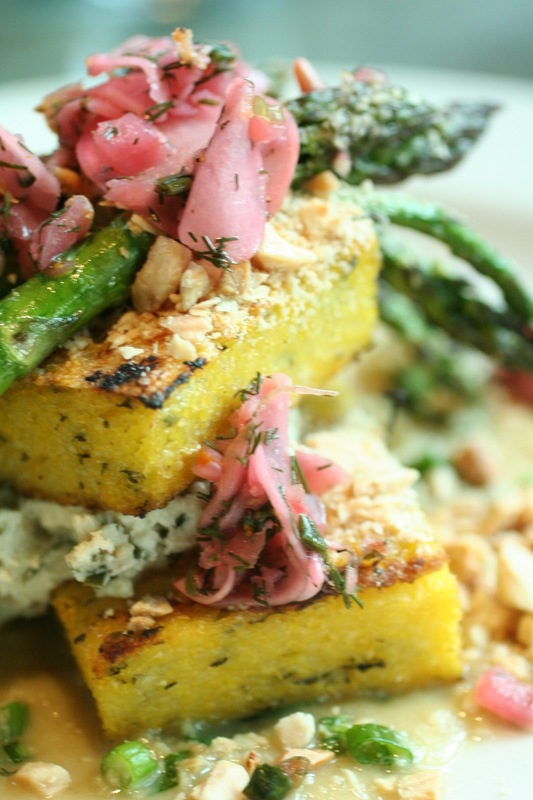 But I was able to stop myself for long enough to photograph the entree, which was polenta with radishes and asparagus, although the preparation and sauces were much more complicated and my description doesn’t do it justice. I’ll just hope the photo says enough. 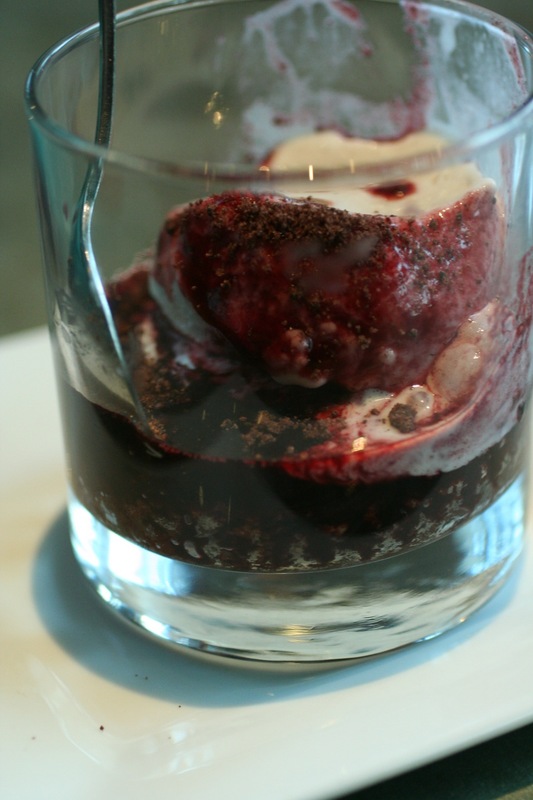 Again, I forgot to photograph my dessert until I was partway through, but I think that gives the photo a nice vibe. GF brownie with vegan ice cream in a port sauce. Lunch of hummus and rice crackers today, but I can’t complain since my dinner was once again exceptional. I suggested Wild Ginger, only a few blocks from the conference, and had three takers. We had the world’s friendliest and most sympathetic waitress. She went out of her way to help me with the menu, and made sure everything was made with wheat-free soy sauce. There were loads of vegetarian items on the menu, and the group of us ate family style. That combined with low light made photography too difficult, so you’ll have to live with my descriptions instead. To start, I had veggie skewers with black-vinegar and ginger sauce. Then we all shared a squash and sweet potato stew with bean-thread noodles. YUM. Then we had Monk’s Veggie Curry, which consisted of large chunks of tofu, eggplant, carrots, and daikon in a cardamom-coconut sauce with bean sprouts on top. YUM YUM. On the side, baby bok choy in garlic sauce and green beans in chili sauce. Also, every dish came with a serving spoon so no glutened utensils got mixed in with the gf dishes. When I passed on dessert (no one else was having any, so I didn’t want to be the glutton), she was so concerned that I might miss out on a chance for gf dessert that she gave us a flourless chocolate torte for free. What an amazing experience. Tonight I saw a Ryoji Ikeda art installation at the Park Avenue Armory. It was beautiful and haunting in its lack of enclosure and agoraphobic cyberspace black-and-white spacelessness. It made me want to make op-art food. Perhaps next weekend. For now, here’s some photos of the food I made last weekend. 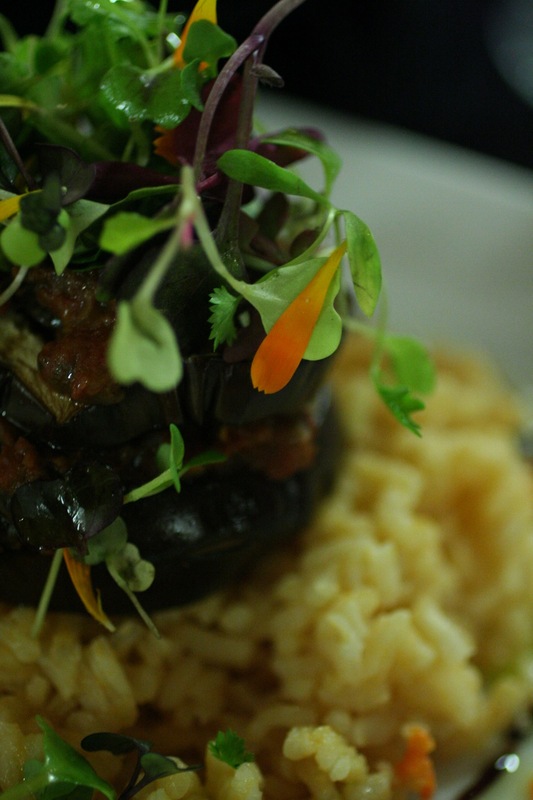 I finally made the millet timbales with black bean salsa, as posted here. 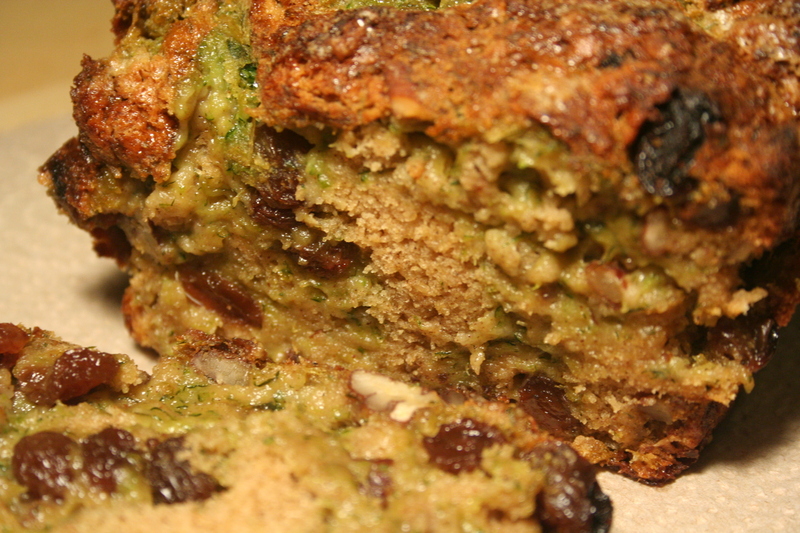 I also baked some zucchini quinoa bread as per Carol Fenster’s recipe and teff-flour peanut butter cookies, as posted here. 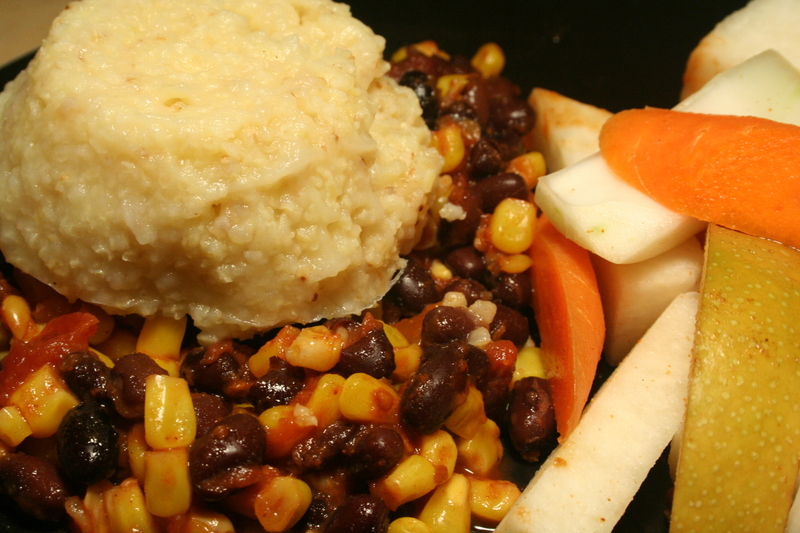 For the millet timbales, the only modification I made was to replace the buttermilk with curdled rice milk (teaspoon of cider vinegar added to the rice milk). 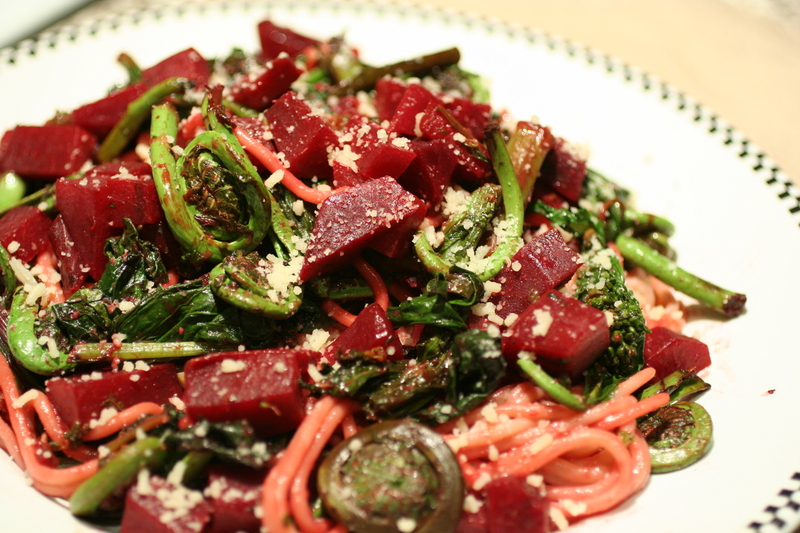 The recipe was superfast and easy and hasn’t bored me all week. 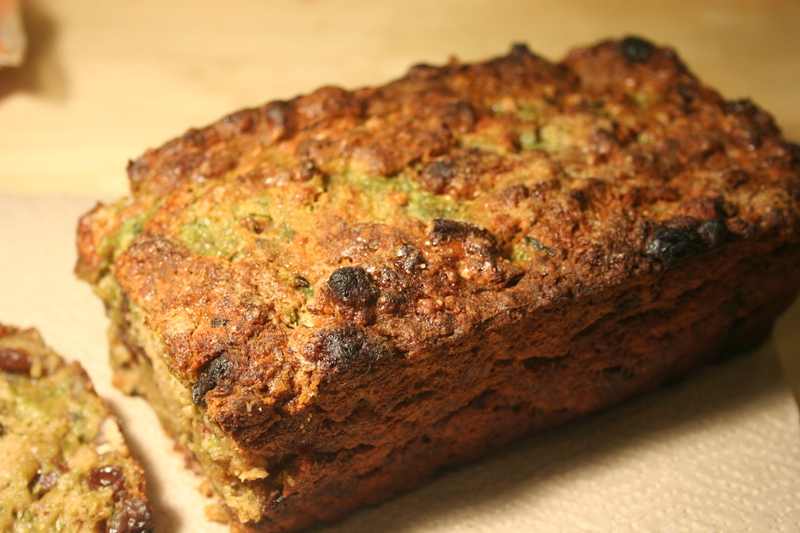 For the zucchini bread, I made one modification: it called for mini-loaf pans, which I didn’t have. Instead, I used a regular loaf pan and baked it 15 minutes longer. The bread was DELICIOUS although it may have had too much zucchini and also started to smell a bit rancid after only a few days so I ended up refrigerating it. 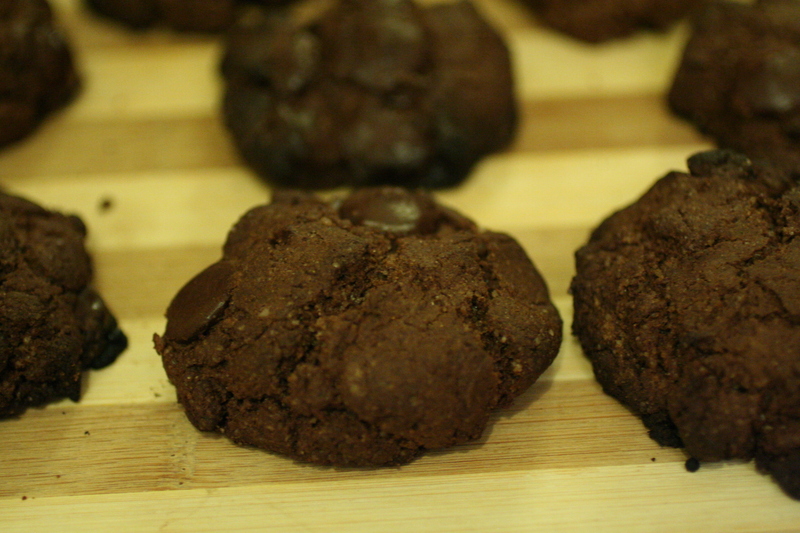 For the teff-flour cookies, I baked the first batch according to the recipe and ended up throwing them out. They were bitter and dry and crumbled in my hands. I was a bit suspicious of the recipe to begin with, since it lacked any rising or binding agents. In my second batch, I replaced the teff flour with a mix of 1 part teff, 1 part brown rice flour, and 1 part tapioca starch. I also added 1 tsp xantham gum and 1/2 tsp baking soda. 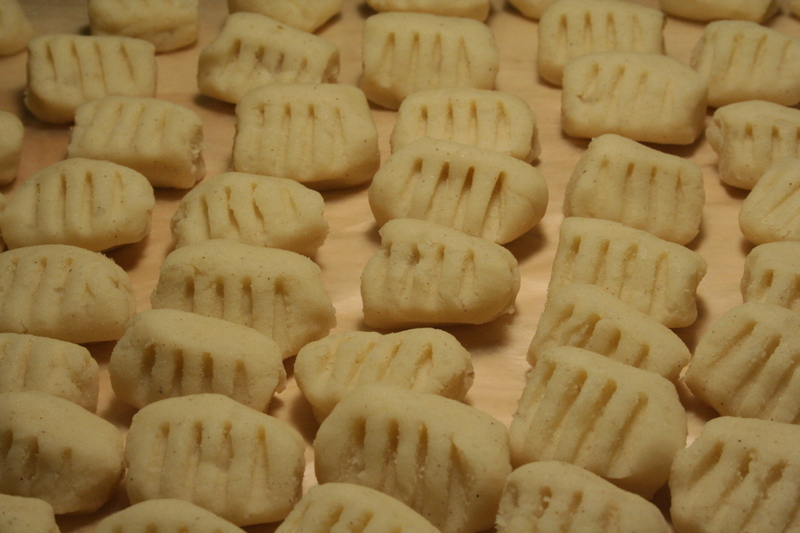 The second batch turned out much tastier, although still slightly crumbly, and not really picture-worthy. However, I was proud of myself for starting to understand the mechanics behind gf baking! In the meantime, not the most interesting or complicated meal but – Hey, look! I got a new lens! Tonight I listened to a live broadcast over WQXR of a 3D mix of the Montreal Symphony Orchestra playing in Carnegie Hall, spatialized by my colleague, Terence Caulkins. Unfortunately I couldn’t listen to the whole thing over headphones (how it is best heard) because I was busy rolling logs of potatoey goodness, but the parts I did (Webern’s Symphony Opus 21, in particular) sounded absolutely fantastic. Thanks, Terence! 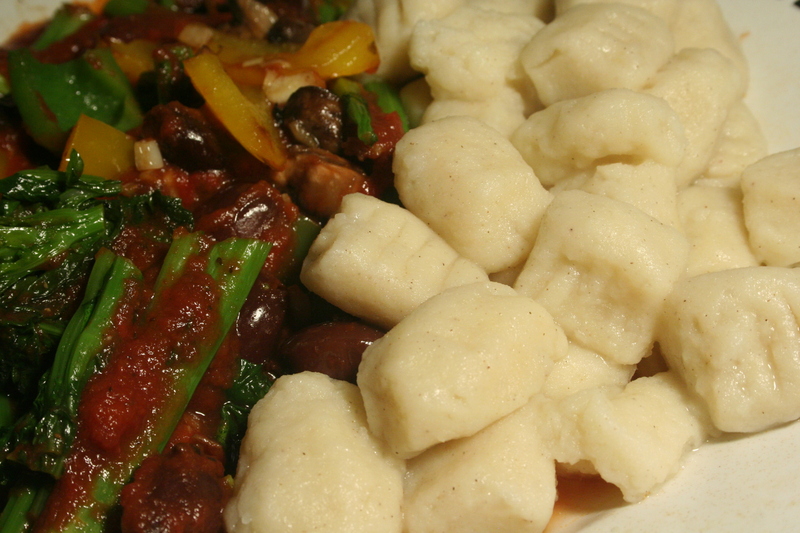 The gnocchi were perfect – melty but not mushy and even a little sweet (the sorghum flour I used was the “sweet” kind). In all, totally worth the effort. Took about 1 hour to make.